An air or gas embolism is a bubble that becomes trapped in a blood vessel and blocks it. Air can escape from the lungs into the blood vessels (arterial gas embolism) or nitrogen bubbles can form in the blood vessels (decompression sickness or "the bends"). Air or gas embolisms can cause serious and potentially fatal conditions, such as a stroke or heart attack. Dial 999 and ask for an ambulance if you or someone you're with feels unwell after scuba diving and you suspect an air or gas embolism. You may not have these symptoms immediately. They can develop within 10 to 20 minutes or sometimes even longer after surfacing. Don't ignore these symptoms – get medical help straight away. Dial 999 to ask for an ambulance if you or someone you're with feels unwell after scuba diving. A diver with a suspected air or gas embolism should be transferred to an A&E department as soon as possible. They should be laid down flat and given 100% oxygen until they reach hospital. Once stabilised, they'll be taken to a pressurised room called a hyperbaric chamber, either at the hospital or at another location nearby. The UK Diving website has details of all the hyperbaric chamber locations across the UK. If a diver surfaces too quickly, nitrogen bubbles can form in their tissues and bloodstream. This is often referred to as decompression sickness or "the bends". Surfacing quickly and holding your breath can cause air trapped in your lungs to expand. This may rupture lung tissue (pulmonary barotrauma), which can lead to gas bubbles being released into the arterial circulation (arterial gas embolism). In some divers, underlying conditions can increase the chance of decompression sickness. These should be discussed with a doctor who specialises in diving medicine. If the gas bubble blocks a small artery, it can cut off the blood supply to a particular area of the body. The seriousness of the blockage depends on which part of the body is affected, the size of the gas bubble and the amount of inert gases (unreactive gases) within the diver's tissues. These conditions are very serious and can be fatal, particularly if the air embolism isn't treated quickly. 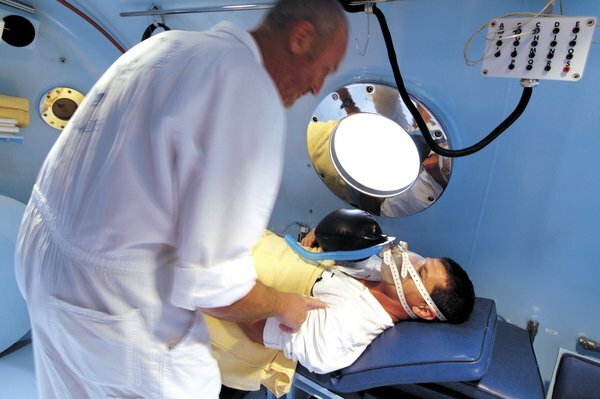 After a diver with an air or gas embolism has received emergency medical attention and their condition has stabilised, they'll be transferred to a hyperbaric chamber. They'll need to lie in the hyperbaric chamber for several hours, breathing a mixture of gases and oxygen in a pressurised environment. The high pressure restores normal blood flow and oxygen to the body's tissues, and reduces the size of the air bubbles in the body. In cases of decompression sickness, the pressure forces the bubbles of nitrogen to dissolve back into the bloodstream. The pressure in the chamber is then gradually reduced to allow the gases to leave the body, mimicking slowly surfacing from a dive. Depending on the severity of symptoms, treatment may need to be continued for several days. The British Sub-Aqua Club (BSAC) has more information about diving safety. Although rare, it's also possible to get an air embolism during surgery or other medical procedures. Air embolisms caused by surgery, anaesthesia or other medical procedures can be difficult to treat. Treatment is usually needed to support the heart, blood vessels and lungs. For example, fluids may be used to treat a fall in blood pressure, and oxygen may be given to correct reduced oxygen levels. Treatment in a hyperbaric chamber is occasionally needed in these cases.